The Sord M23 Mark III was available with 12" green monitor or a 14" color monitor. Despite the M23 featured a cartridge port, all of its important software came on floppies, including the ground-breaking PIPS-III and several BASIC compiler variants developed by Sord and running on their own OS. A lot of good business software and games were written with these. There were later Mark systems released, including a Mark I with the world's first 3.5 inch floppies deployed, and the Mark V with eight inch drives -- the Mark III had 5.25'' floppies. There was also the Mark X with a 10MB hard drive. 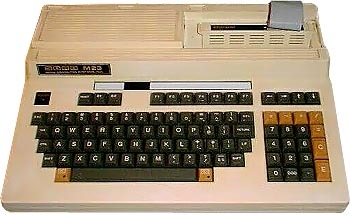 Around 1983 or so the "M23EX" was released - this was basically an M23 with the mk41 drives (5.25" DSHD) housed in an M68 case (more PC-style with separate keyboard and floppies in the main case). It was a low cost option contemporary with the more expensive and better spec'd M68. see more Sord M23 Mark III Ebay auctions !